Sustainable sourcing, feeding the planet and attracting and retaining young people in the industry are all key issues that will be addressed at the 2018 Scottish Chefs Conference. 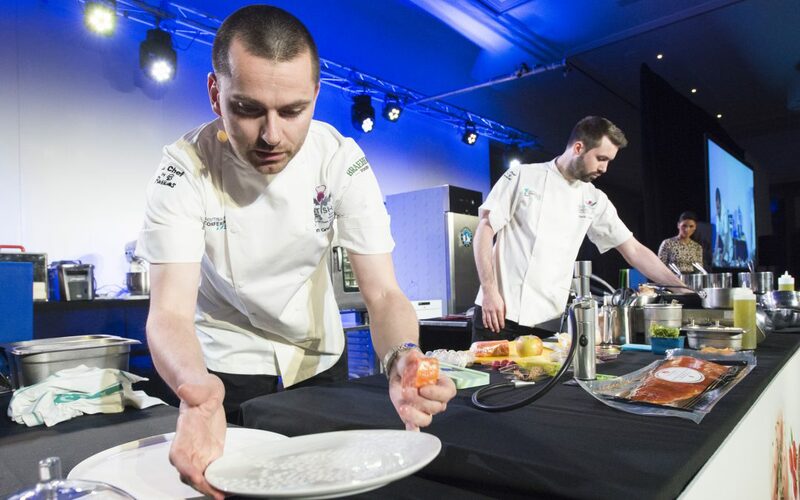 With over 500 attendees the event held on 5 November 2018 at The DoubleTree by Hilton, Glasgow Central is the largest annual gathering of Scottish Chefs. Two incredible young chefs, Adam Handling, and Gary Millard will join us to share their experiences. Adam Handling is a Scottish chef who has a string of culinary competition wins and industry accolades to his name at just 29 years old. Gary Millard’s talent for pastry was spotted by Albert Roux when he was just 14 years old. Since then, he has trained across a number of Roux properties, earning the title of Patisserie Chef of the Year in Scotland 2018 at the Catering in Scotland Awards, aged just 22. The line-up also showcases two of Scotland’s most well-known sustainability champions: Jim Cowie is all about the sustainable handling of our seafood and has held regular talks and cooking demonstrations at schools and local organisations. Neil Forbes is a well-known figure in the Scottish culinary scene. His much-loved restaurant, Café St Honore, holds Food Made Good (Sustainable Restaurant Association) 3-star champion status. We are also delighted to welcome our international guest, Christopher Koetke, who has worked in culinary arts for well over three decades and is now CEO of Complete Culinary LLC, a consulting firm dedicated to the 360-comprehensive view of food and beverage. He is currently the chairman of the Feed the Planet Committee of World chefs and a recognised authority on food sustainability. At the helm, this year and holding the programme together and helping delegates to get the most from the demonstrating chefs will be well known Scottish restaurateur and chef Jak O’Donnell. The conference will be introduced by James Withers, chief executive, Scotland Food & Drink and Albert Roux OBE, KFO, Patron of Scottish Chefs will also be attending.